Ban the tech. Pass the tech. Medical students and resident physicians are realizing that technology can have both a positive and negative impact on the health of Albertans. Two projects that have received Alberta Medical Association Emerging Leaders in Health Promotion grants have opposing views on the use of technology. One is using handheld technology as a way to interact with children exposed to domestic violence. The other wants to ban all forms of mobile technology while driving. Distracted driving legislation has been in effect in Alberta for over a year, but University of Calgary (U of C) medical student Peter Iglinski doesn’t see much of a difference on the roads today. Iglinski doesn’t believe the legislation goes far enough. He is a member of a province-wide coalition that wants to eliminate all cell phone use – including hands-free – while driving. Students for Cellphone-Free Driving (SCFD) was established in 2009 by University of Alberta (U of A) medical students to raise awareness about the issue amongst peers and high school students. Creating the new chapter has been a seamless experience, especially with the support of the Edmonton chapter, which has already developed curriculum and interactive presentations targeting high school students. The challenge for Iglinski and his fellow students has been to market the Calgary chapter and reach out to Calgary area schools willing to participate in the initiative. Both Edmonton and Calgary chapters are partners with the Coalition for Cellphone-Free Driving, a group of companies and organizations who are committed to reducing cell phone use while driving. The coalition is led by Dr. Louis Hugo Francescutti, an Edmonton-area emergency physician and the president-elect of the Canadian Medical Association. For Iglinski, Dr. Francescutti is setting a wonderful example of physician advocacy and leadership. “We always think about the work of physicians as simply treating diseases or conditions,” added Iglinski. 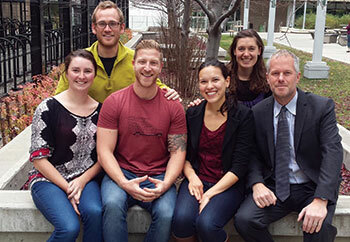 The chapter is planning to expand its reach to more Calgary-area schools with a brand-new group of medical student volunteers for the new semester. U of A resident physician Dr. Maryana Duchcherer believes in the value of preventive care, even in the field of psychiatry. In fact, according to Dr. Duchcherer, traumatized toddlers and preschool children have a tendency to express their stress by adopting various patterns of attachment and expressing distinct emotions. She believes it is possible to prevent further development of behavioral, cognitive or psychiatric issues by identifying these patterns and intervening in formative childhood years. This is where her project fits in. Its main objective is to help affected children gain confidence in expressing their thoughts and feelings. It also promotes the value of sharing and engaging in positive interactions with other peers with the use of technology. Equipped with a set of Apple iPods, Dr. Duchcherer and her team are working at an Edmonton-area shelter for victims of domestic violence. To date, she has worked with more than 12 children at the residence, guiding them through different projects using various software applications. “More importantly, the device facilitates what I call a translation of their inner self, through drawing or listening to music.” Dr. Duchcherer is already seeing results with her work. She recalls her observation of a four-year-old girl who was at the shelter. Examples like this will be used as part of a final assessment of the children who participated in the project. In addition, Dr. Duchcherer plans to survey the mothers of the children and ask them to share their observations about the impact of technology on their children. This article originally appeared in Alberta Doctors' Digest. The AMA Emerging Leaders in Health Promotion grant program supports advocacy initiatives of physicians-in-training.